Chitter chatter regarding a possible new range of Nvidia graphics cards based upon Turing GPUs – but without any raytracing capabilities – has been increasing on tech news sites and forums in recent days. Earlier this week, for example, on the HEXUS front page I have reported upon Nvidia GeForce GTX 1660 Ti benchmarks appearing in the Ashes of the Singularity (AotS) online results browser. Yesterday, in a comment on that article, I followed up with a photo of what is purported to have been an Nvidia GTX 1660(Ti) tech event in China (photo reproduced below). 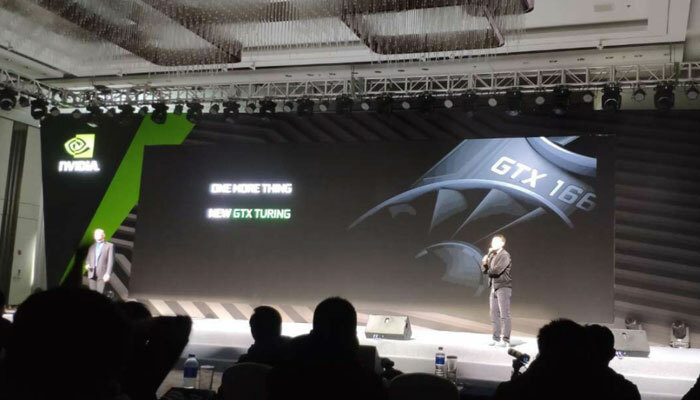 Yesterday evening tech site HardOCP published some significant details about the launch of new GTX-series Turing-based graphics cards. According to the site's sources (multiple) the Nvidia GeForce GTX 1660Ti, that has been vibrating the underground news wires so much recently, will officially launch on 15th Feb (three weeks away). Furthermore, HardOCP claims the MSRP will be $279. We don't know if that price is for an Nvidia branded model or a third party design estimate. The news Turing GTX spill doesn't stop there. Nvidia has at least two more cards planned to fit in the spaces below the new GeForce GTX 1660Ti and above ye olde GTX 1050Ti. Firstly, the Nvidia GeForce GTX 1660 (non-Ti) will be arriving in early March, this will carry an MSRP of $229 says HardOCP. Secondly, the brand new GTX 1650 will become available in late March, this will carry an MSRP of $179. Subsequently the GTX 1050Ti price will drop into a suitable position with regard to its comparitive performance level. Lastly, HardOCP shares a word of warning. Though it stands by its dates and pricing info, it says that the "exact launch prices are still in flux". Furthermore, we are told to remember that pre-launch leaked benchmarks tend to be rather unreliable. It is always interesting to see such pre-launch info nuggets but people have to wait until after-launch to buy new graphics cards anyway, and by then sites like HardOCP, and of course HEXUS labs, will have independent reviews and comparisons for you. Feels like preemptive attack on AMD. Nvidia really want them out of business. It's coming in at about the same bang per buck as the RTX2060 if the 20% performance boost over the 1060 is ture, but without the DLSS and Raytracing abilities….seems pretty poor value to me. I'll be interested to see what they can bring to the table within 75W….1060 performance would be nice, but I expect that'll be with the next gen's 7nm offerings.